Award-winning humorist Barry Parham relentlessly documents the humorous facets and foibles of our shared human condition, and has been sharing his irreverent observations for some time, through humor columns, essays and short stories. Parham's first book, the 2009 sleeper, "Why I Hate Straws," has received numerous awards. "Why I Hate Straws" is an eclectic compilation of observations about life on Planet Earth. His "what's wrong with this picture?" commentaries run the gamut of topics from family, to politics, to dating (or not dating) and even ferrets. From the frustrations of trying to save the planet, one light bulb at a time, to analyzing the inane concepts that define daily television advertising, these brisk, bite-sized stories will strike a chord with anyone who grew up in (or in spite of) American culture. In October 2010, Barry published "Sorry, We Can't Use Funny," another award-winning collection of general-topic satire and humor, and the more targeted "Blush: Politics and other unnatural acts." Parham is an honors graduate of the University of Georgia, a music fanatic and a self-described eco-narcissist. Humor columnist Barry Parham is back, launching his latest salvo of hilarious, thought-provoking, take-no-prisoners observations. "Single guys buy milk in small, manageable doses, as if they were bringing home work, or morals. It would never cross a single guy's mind to buy an entire gallon of anything, much less some expiring liquid that can mutate into something that smells like Detroit looks." "I'm the first to admit that racing takes talent ... not to mention bravery. But, there's bravery involved in putting your hand on a hot stove, too. Sadly, though, after you're done with the stove, there's nothing much left but discipline, and learning to write with your other hand." "Contestant #3 was unable to make it, but he did swing by and vote 'Present' so we would validate his parking, and he would like to remind our studio audience that was for showing up before he was against it." So hop aboard for Barry's fourth collection of looks at play, work, art, TV, cultural norms (a very short chapter, that one), ads, fads, politics, the internet, anti-social networking, and why the end of the world might be late. And yes, Straw-Heads, the ferrets are back. Humor columnist Barry Parham unleashes this first set of satire, humor, and indignations. 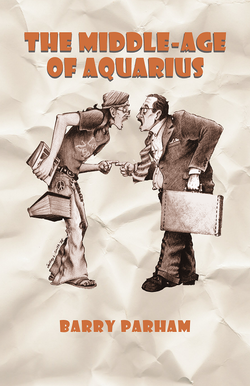 His perorations poke at family, dating, politics, culture, good and bad decisions, and ferrets. "Why I Hate Straws," the first printed collection from humorist Barry Parham, is an eclectic compilation of observations about life on Planet Earth. I finally decided to try one of the new, non-threatening light bulbs – you know, one of those curly things that looks like soft-serve ice cream, costs more than a tanning bed, and is guaranteed to save me up to 12 cents between now and the formation of any new continents. You may be thinking, though probably not, 'how does a mere mortal build a web site?' Well, it's really quite simple. I type normal human words, wrap them in weird code words, and suddenly you're able to download air-brushed pictures of moody Nordic women. Health insurance can't possibly kill you, because you never actually get any health insurance. What you get is a health insurance policy, written by some deranged lunatic, sitting in a dark bar booth at 2am, with a legal thesaurus and a "How To Cheat At Scrabble" paperback, near the tailing end of a probably toxic and definitely criminal bout of participation in Intravenous Tequila Injection Nite. Following the success of his first book, the 2009 sleeper, "Why I Hate Straws," online humor columnist Barry Parham delivers again. Satire at its best! Includes the award-winning stories "Actuarial Family Theater" and "Perfect!" In the interest of full disclosure, I admit there's an extant 1970's photo of me and a date, posing for the obligatory parental pre-prom photo. My date was gorgeous, and sane. I, on the other hand, showed up with the hair of a medieval barber. I looked like an electrocuted yak. Somehow, February got this reputation as a month of romance, maybe because it's cold. Plus, football's gone and we're stuck with the wildly popular sport of bowling, where you almost never get to see any serious violence. St. Valentine's Day contains vestiges of both early Christian and ancient Roman traditions, alongside other time-honored traditions, like hot-dish picnics and mass public executions. Holiday Factoid: "vestiges" is the classical Greek plural of "vest." A local TV station was updating the community on snowstorm-based church closings. According to the typists at the station, there was a church somewhere called St. Martyer. Imagine - an entire religious sect dedicated to turning people into Ernest Borgnine. 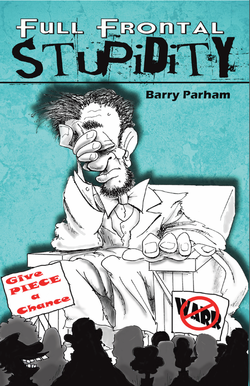 Humorist Barry Parham is back with another acute collection of satire, targeting politics and other evils. And when Barry's inside the Beltway, no party is safe. I'm building a politician, in case you're looking to buy one. For a while there, I was thinking of running for office myself. But I'm not going to lie to you. And there it is. If I can't lie to you, I'm not politically viable. Before the ceremony, the incoming First Couple met the outgoing First Couple on the steps of the White House. Suddenly, the Clintons leapt out of the First Shrubbery, stole the gift, and spirited it off to their First Legacy Museum. Bill Clinton then pardoned the shrubbery. During a bone-chilling outbreak of global warming, Barack Obama was inaugurated President of the United States, got three votes for the Papacy, and won the Rose Bowl. He immediately set the tone for his administration by having world-class musicians fake a music performance while not paying their taxes. The new President then introduced us to his "twin-teleprompter" speaking style, making him look like he's constantly talking to two very tall voters on opposite sides of the room. Later in the month, Congress presented a Health Care Bill that everybody agreed was probably well-written. Includes the award-winning story "Razing Arizona!"